A relay is essentially a switch that is operated electrically rather than mechanically. Although there are various relay designs, the ones most commonly found in low voltage automotive applications are electro-mechanical relays that work by activating an electromagnet to pull a set of contacts to make or break a circuit. 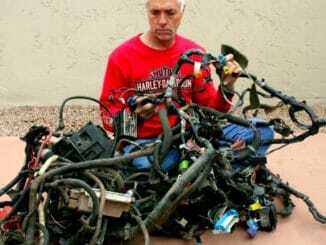 These are used extensively throughout vehicle electrical systems. The spring holds the contact open until current passes through the coil (At Rest). The coil then generates the magnetic field which closes the contact (Energized). What do the numbers on a relay mean? 87 and 87a are the two contacts to which 30 will connect. 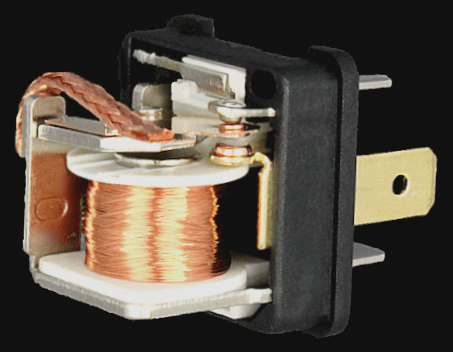 If the coil is not activated, 30 will always be connected to 87a. You can think of this as the switch in OFF. When current is applied to the coil, 30 is then connected to pin 87. You can wire relays to be either open or closed, depending on how you need your accessory to operate. If you want a normally closed relay, you will want to wire to 87a. If you want a normally open relay, you will wire to 87. 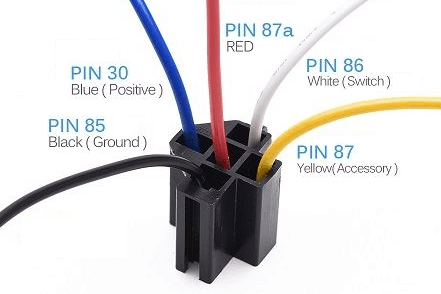 Although most relays are clearly labeled, the 30 pin is always set perpendicular to pins 87 and 87a for easy identification of the power source pin. 85 and 86 are the coil pins and will be transferring the current through the coil. 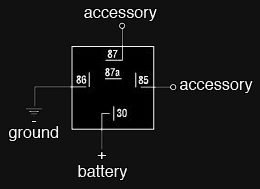 85 will be used to ground your relay, while 86 will be connected to switchable power. 87 and 87a will be connected to your controlled accessories that you wish to turn on and off with your relay. 30 will then be the pin connected to your battery power. Why do you need to use a relay? 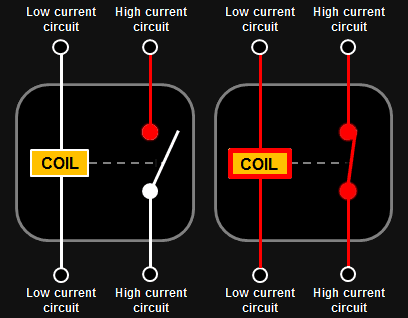 Switching a high current circuit using a lower current circuit — This is the most common reason for a relay. This is useful where an in-line switch or the existing circuit does not have the capacity to handle the current required. 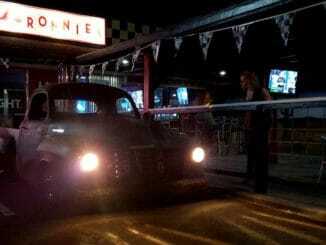 For example, high power lights that come on with the headlights — There is a risk that they would exceed the capacity of the existing loom. Activating more than one circuit from a single input — With a relay, you can use a single input from one part of an electrical system (e.g. manual switch etc.) to activate one or more relays that then complete one or more other circuits and so carry out multiple functions from one input signal. Carrying out logic functions — Electromagnetic relays can be put to some quite clever (and complex) applications when linked up to perform logical operations based on certain inputs (for example, latching a +12V output on and off from a momentary input, flashing alternative left and right lights etc.). 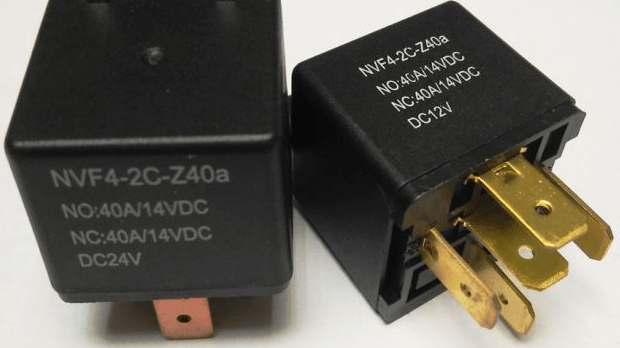 Of course, many of these functions have been replaced by OEM infinite wisdom, but it can still be useful, fun and often less expensive to use relays to perform these tasks. Cost savings — High current capacity wiring and switches is more expensive than low(er) current capacity versions. By using relays, the requirement for the more expensive components is minimized.